1. MORE RED: If you desire to increase the difficulty, simply add more red to the deck and less blue. The opposite is true as well. 2. HIGHER NUMBERS: If you desire to increase the difficulty, simply add more Red Level-2 cards to the deck and less Blue Level-2 cards. The opposite is true as well. 3. COMBINATION: by using the above two tools, you can engineer almost anything you want in terms of difficulty level. Keep in mind that it is possible for you to make the entire deck Red (bad cards), Blue (good cards), or anything between. 4. FORCED REWARDS: If you wish to make the game extremely hard, you will likely want to add this rule. The rule dictates that players MUST take rewards in the game when offered. 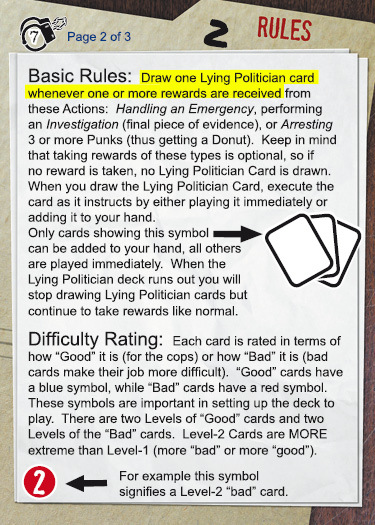 This forces players to ALSO take the Lying Politician Card that accompanies the reward. Without this rule, if you stack the deck with cards that are excessively difficult, players will (potentially) always conclude that taking the reward is the wrong decision, but this is not fun! By requiring that players take the rewards and the Lying Polictian card (both) we avoid this problem and the path to notching up the difficulty as high as you like is wide open. 5. DECK REDUCTION: If you decide to Reduce the size of the initial set-up deck you are effectively making the game easier because you will reach a point in the game SOONER whereby the Lying Politicians deck has been exhausted, which enables players to take rewards without needing to take a Lying Politician card (which is a good thing unless you happen to have stacked the deck with more Blue Cards then Red). 7. VARIANTS: Below you will find a variety of variants for playing the game. They are an easy way to adjust difficulty and create variety. 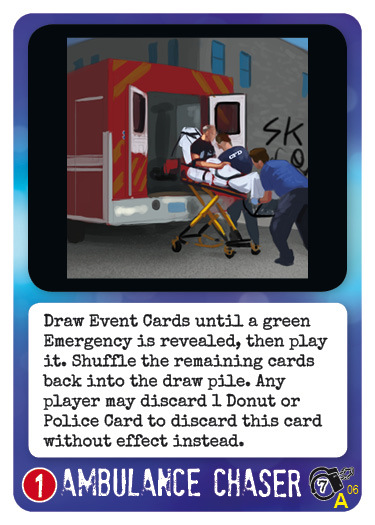 The variants all stem from different ways of setting up the deck in the beginning of the game. The default method for this is listed in the section above called “Set-Up”, but let’s now take a look at a few other ways it could be done. For fun and variety sake, feel free to try any and all of these. Also, if you figure out a new set-up or way to play, please feel free to make tell us (and the community) about it by posting in the forums section on the Boardgamegeek page for Police Precinct OR on the page especially for Lying Politicians! This method allows groups to stack their deck with their favorite cards. To finalize this set-up, follow the same three steps as was done in the default except that during Step Two, you would not randomly select the cards, you would look at the cards and select the ones you desire! With this method, you can use any number of cards in the deck and any number of cards in each group/level so long as the total for all the cards adds up to zero. Example: 4 Level Two Negative cards combined with 8 Level One Positive Cards would create a deck of 12 cards that adds up to zero. The end result of this set-up will be an easier game than the default method. This is true because the default deck has a negative four overall score. Also keep in mind that reducing the size of the deck makes it easier. 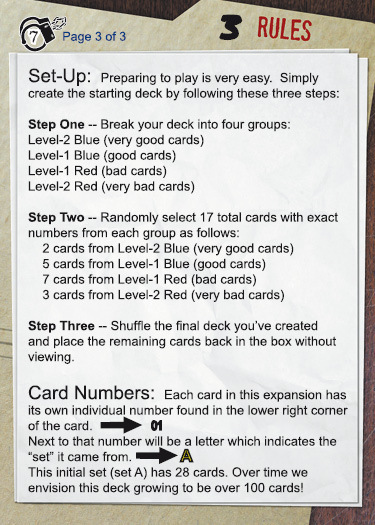 This approach is great for anyone who wants to reduce the difficulty AND make their own deck! This approach is just like the “Zero-Out” (see above) except that the intent is to INCREASE the difficulty of play. In this case, stack your deck in any way you wish so long as the overall score is Negative Five or greater. If it is, and if the number of cards in the deck is at or above the 17 mark, then you will have created your own deck that is HARDER than the default. Then, from the remaining cards, deal out 6 random cards. Next, combine the 6 random cards with one of the two 10-card stacks, but make sure that the stack you use is randomly selected. Now you should have 16 cards ready to go for your game and you should have no idea if they are stacked against you or in your favor. Shuffle the 16 cards and begin play after placing the remaining cards in the box. This is the easiest one to set-up. Simply shuffle the cards (all of them) and place face-down. That’s it, you’re ready to play! The plan for this expansion is to grow it using “Sets”. The first “Set” (known as Set A) was born through stretch goals during the UPLIFT Kickstarter Campaign. Set A is 28 playable cards plus 2 rules cards. The plan is to add another set in some future Kickstarter, and possibly in EVERY future Kickstarter. In early 2016 we will be running a campaign for Season II of Police Precinct and see this as a likely candidate for a series of Stretch Goals. Over time there might be several sets totaling over 100 cards. That is the direction we would like to see Lying Politicians headed. 2. The card images are in a special order starting with the back of card number 1, then its front, followed by the back of card 2, then its front, and so on. The best part of this form is how dang SHORT it is! Just input your email address and you’re DONE! Signing up will result in ONLY occasional emails from us (and ONLY from us, because we will NOT pass on your info to anyone else EVER!). Dave Kudzma is the designer of this aspect of the Ole Steiness game Police Precinct. It has been a great pleasure for us at Common Man Games to have been able to work with Dave in the development process, and to ultimately publish this unique addition to the game. Thanks Dave! My first though is to mention that it’s been a huge honor to be able to work on an Ole Steiness title. From the moment I first saw Police Precinct a fire sparked inside me that I can’t put out. Ole’s masterpiece offers so many ways to expand and evolve that my mind just keeps racing. I really do lose sleep just thinking about it. Lying Politicians has been a really fun way to start to see some of that take hold. Watching this deck grow over time will be fun, plus I hope to bring several other expansions out over the coming years.